Seller: HarperCollins Christian Publishing, Inc.
© HarperCollins Christian Publishing, Inc. I use this app during my breaks at work and love it; the only thing I wish would to turn your other books in apps also!!! I have two of the books but they never seem to be where I need them. 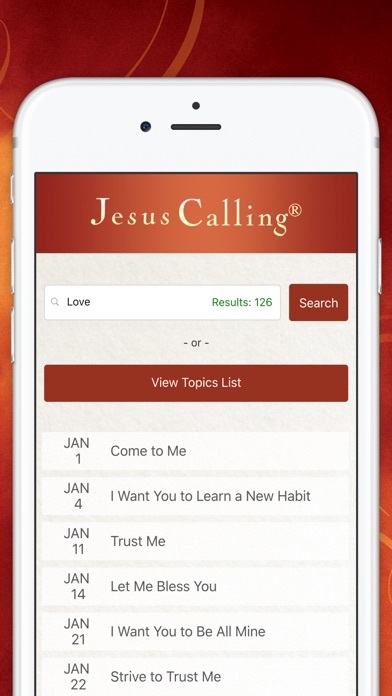 This app makes the devotionals available whenever and wherever I need them! This application worked great until the most recent update. Now when it starts up all that happens is a white screen. Rebooting the phone has not helped. Uninstalling and reinstalling has not helped. Please fix this app so I can be wonderful and useful again. After the up date this app it will not open on my phone. It goes to a blank white screen? Can you suggest a solution? I have had the app for more than a yr. & loved it. I would love to have access to it again. I LOVE the Jesus Calling book. The app has completely stopped working. I am only getting a white screen when I try opening it. Super sad. Since the most recent update occurred, I can no longer copy, post on image, and share this devotional on social media. Please fix soon! This is a great app! I always enjoy using it! When I hit “share text”, then sent it to myself, it only shows me the option to purchase the Jesus Calling app. How is that sharing the text from a particular day’s devotion??? I have witnessed the effects of Jesus On several of my friends after they added this daily read. Truly amazing!!! If you’re charging for an app, you keep it updated. The fact that it looks terrible on the (Not-so-new) iPhone X is frustrating. I’ll have five stars ready for you when it seems you’re supporting the app you are charging good money for. I love waking up and Jesus is watching! I have highly recommended this app. For the most part I enjoy the devotional... I find it disturbing when the scriptures do not properly capitalize “Him”, “He”, etc. (when referring to God). Also, it would be nice if the app filled my screen (I have an iPhone X). I feel like I’m reading an outdated app. If you’re paying $9.99, you expect an app to be supported... not left adrift to collect funds without meaningful improvements. The iPhone X has been out for well over six months. It’s time to update the app. The only true way to having a great day is knowing The love Jesus has for us. This devotional helps me stay in that mindset each day. Thanks you for publishing this beautiful reminder of Gods presents! Every time I open it, all I get is a blank screen. This just started happening, sometime after the end of June 2018. Your latest update eliminated the Jesus Calling icon photo. It’s now just a plain design grid. Opens with welcome letter from Nelson but non responsive to continuing to open the app. All other apps function normally. Is there a delay factor??? Freezes often. Don’t like the letter that comes up every time. Could it come up another way or less often. Hope is a golden cord! 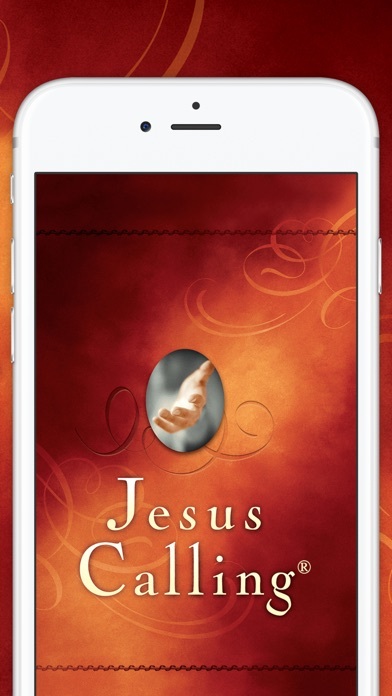 I love Jesus calling and I wish I could gift it to people whom are using Android devices! IF there is a way please advise! I have bought the audio version and the Bible to continue my devotions! Excellent!!! A message comes up EVERY TIME I open this app to tell me that the app has been updated. All I want to do is read the devotion for the current date. After reading your message for weeks, I realize it’s been updated. Please don’t tell me again. While Sarah Young's content is great and worth the expense, the app is incomprehensibly buggy. Come on Harper-Collins, read the many poor operational reviews; this is simply an expensive text reader...hire a competent developer and fix it! For the past 2-months, my copy yields nothing but a white screen on opening; after many attempted restorations, I have, regrettably, had to give up on this app. I am not sure it’s a good idea to rephrase what Jesus himself said and to make your own twist to sound like they are His words. I feel His words are good enough. Please update this app to function on later model iOS devices (i.e. iPhone X). It would look and flow so much better if the entire app screen covered the length of the screen on my mobile phone. I have loved this app for years. Since the last update, the app will not open. It is blank. Please fix this! I’ve been reading Jesus Calling for 10 years now - being reminded everyday that Christ is for me, He loves me, and that He is trustworthy God who has a good plan for me never gets old. The convenience of this app means I can read it everyday, wherever I am! I really treasure this app! I read it every morning and it always has just the right message I need to start my day!! Highly recommend it!! 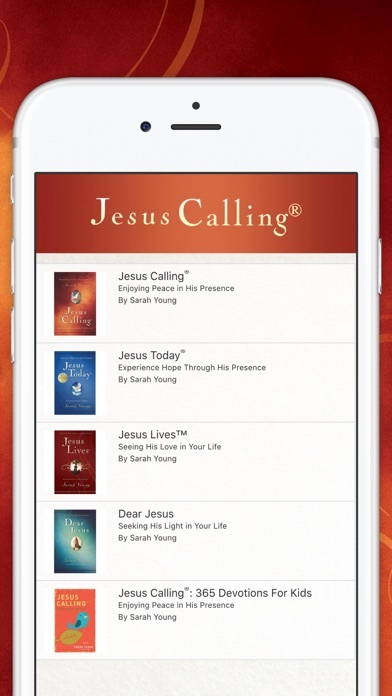 I love that Jesus Calling can be on my phone if I don’t have the bookform on my possession. I’m a very busy person and sometimes i really want to read it but i’m too busy but alot of times not too busy too listen such a sitting in traffic. So instead of all that wasted time in traffic could you please spare from out traffic frustration by providing an update to this app so we hear the Jesus Calling Devotional while sitting in traffic? Thank you so much! I love this app!! I need a highlighter feature, please. Thank you. Rating would be a 5 if it had a highlighter. So important. Thank you. Once again, the journaling disappears. So disappointed since i cannot write in my paper copy, as i am recovering from a stroke. PLEASE fix that. I use JESUS CALLING everyday. GOD always has a message there for me. Feb 7,2018 So disappointing since the messages seem to talk about exactly what I’m dealing with that day. I love these daily devotionals. They are very inspiring. Have have this app and the physical desk calendar. Love them both. I haven’t had any crashing or bug problems. The app’s user interface needs updating to allow it to work in landscape mode on an iPad. I am very happy with the app now. I quit reading the messages because I couldn’t read them in landscape view after the latest update. I really enjoy the messages and I’m so thankful to be able to read them again. My earlier reviews are below. ... Initial Review: I opened the app today and it's totally different and awful! It doesn't automatically open on today's message and the message is not written on an attractive background anymore. Hate it! Please change it back! .... Second Update: The app has finally been changed and it looks better although not as nice as the original. There is a big problem which is that the footer covers up part of the message and there's no way to read the bottom of the message without holding your finger on the screen while reading it. Please fix this glitch! Another problem is that the message sometimes opens on the previous day's message so you have to make sure that you know today's date. .... Third update: The app has been freezing up lately. I have been able to fix it by closing it and reopening it or rebooting my ipad but today that's not working. Now I can only read the portion of the message that comes up and cannot scroll down to read the remainder of the message. I also do not like that I can only copy and paste 300 words at a time. This makes it very difficult for me to save and organize meaningful messages for my own future reference. It looks like the author is more concerned about herself than others. .... Fourth Update: Ever since a recent update, I cannot view the app in landscape view on my ipad so I’m not looking at the messages anymore. My ipad is top heavy and falls out of my keyboard in the upright view. From the very beginning, I’ve been able to view it in landscape view and I’m so frustrated that that view is not available anymore — and I think I paid for this app! Harper Collins said they might address this in the future. I’ve never had more problems with any other app. I was happy with it at the beginning but they keep messing it up! This is a great devotional. One of my favorites! When I scroll down on the current day, it shifts immediately to the previous day. They seemed to have fixed all the bugs and issues everyone was complaining about. Easy to use and navigate. Many different text sizes available. The print changes are horrible!! You did an update on the app recently and now when you scroll up to read it changes to a completely different date and page. It's almost impossible to get through one reading without losing your place 3 or 4 times. Very annoying. Please fix your app!!! I want to be able to scroll up when reading but do not want to go to a new month. FIX IT! It goes to JANUARY 1st UGH... Please fix quickly! Love the Devotions! A family member has a galaxy and did not have to pay for Audio why do IPhone users have to pay almost $30 that unethical if you want my review !!! This app does not work. Can I be refunded? Since I made the last update my app is locked up and unable to move up or down or to another day to read. Im afraid if I delete and redownload I will lose all the like stars I have set and I do not want to pay for it again since I already purchased. I really wanted to have this digital version, but now I think I need to lose the $10 - and money is really tight - and just get the Kindle or hard copy. This app crashes, sticks, I can't navigate it without something locking up. Please consider fixing all of these bugs and issuing an update. Or maybe allows to return the app because it is not working. Took a chance despite reading negative reviews on functionality. After a minute of downloading and using app, it froze - several times. Please update App! This is such a great devotional! Thanks for fixing the date! Looking forward to the next update! DLMMen'sGroup not sure what you are talking about since you can copy and paste freely and share however you like. I use the email feature all the time! I love this app and look forward to reading every morning. I am a bit frustrated though that all the recent bug fixes have not fixed the freezing it does upon opening and then when you close it and reopen it starts back at January. Please include this problem in your next bug fix. Thanks in advance. I really enjoy this app. Devotions are well written and on point. It always motivates me for the day ahead. 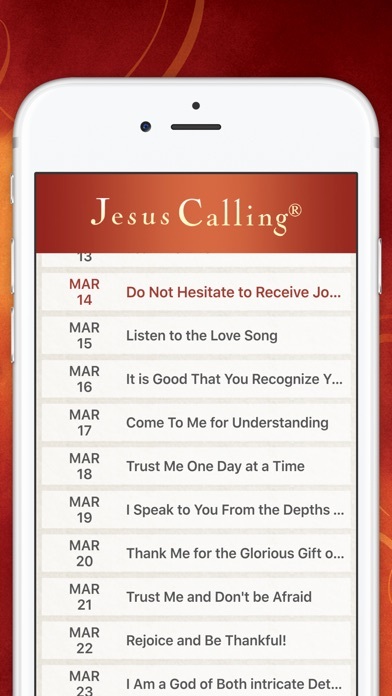 Love Jesus Calling, but this version is not good at all. I can't read a full page without it scrolling to another day at lest 3-4 times. I love the app when it works! I just updated so the date would come up correctly and now it freezes on my IPad while I'm reading the daily devotional. Will not swipe up, down or go back to the main page. Please get the bugs out! I want the old version back! Most recent update is at the bottom. I opened the app today and it's totally different and awful! It doesn't automatically open on today's message and the message is not written on an attractive background anymore. Hate it! Please change it back! .... .... Second Update: The app has finally been changed and it looks better although not as nice as the original. There is a big problem which is that the footer covers up part of the message and there's no way to read the bottom of the message without holding your finger on the screen while reading it. Please fix this glitch! Another problem is that the message sometimes opens on the previous day's message so you have to make sure that you know today's date. .... Third update: The app has been freezing up lately. I have been able to fix it by closing it and reopening it or rebooting my ipad but today that's not working. Now I can only read the portion of the message that comes up and cannot scroll down to read the remainder of the message. I also do not like that I can only copy and paste 300 words at a time. This makes it very difficult for me to save and organize meaningful messages for my own future reference. It looks like the author is more concerned about herself than others. .... Fourth Update: Ever since a recent update, I cannot view the app in landscape view on my ipad so I’m not looking at the messages anymore. My ipad is top heavy and falls out of my keyboard in the upright view. From the very beginning, I’ve been able to view it in landscape view and I’m so frustrated that that view is not available anymore — and I think I paid for this app! Harper Collins said they might address this in the future. I’ve never had more problems with any other app. I was happy with it at the beginning but they keep messing it up! The latest update is great, thank you! Functionality and readability are great! Appreciate the responsiveness and constantly working to improve the app and fix things. The content has always been amazing, so thank you! New version does not flip to landscape on your iPad if you want to read it that way. This is very annoying for those of us who prefer this axis. Not sure why you would restrict this to only a portrait axis read. Let readers decide which way they want to read JC. Please make a version that fits the iPhone X resolution. It’s cut off at the top and bottom. Absolutely inspiring devotional ! I read it everyday day ( mostly ) year after year and each time, I get different inspirations from the Word and her daily devotionals for the different situations I am in. Absolutely amazing to me ! I love the note taking feature ! I also send inspiration notes to my friends. First, I love this app even though it’s not the same as the original one, simply because of the content. There is one thing that would would be nice —being able to switch easily to the Jesus Always content that I downloaded. It takes 3 or 4 steps, then you have to do that again to get back to the Jesus Calling material. I would be so nice to be able to toggle back and forth. Thank you. Could you please bring back the serif font and line spacing used previously? It was so much easier to read. I want to be able to read Jesus Calling on my iPad in LANDSCAPE orientation, but am no longer able to do this. Please fix orientation issues. Seriously, millions of people using this app and the developers can’t get it right?! Stuck in portrait mode, really?! Screen freezes, really? Super sensitivity, really?! Having to reboot the app on IOS on iPhone7 and iPad Air, seriously?! My subscription to almost every other app works 5 times better. Hire some techies who can actually make your updates not downgrades. You’re making God look bad. I am grateful for the content. Love the ap. However, this latest update presents the text only in portrait view. You removed the ability to view in landscape. Why? Please give us back this ability. I have always used this app in landscape position. However, after the latest update it will not change from the portrait setting. Please make this a choice again. 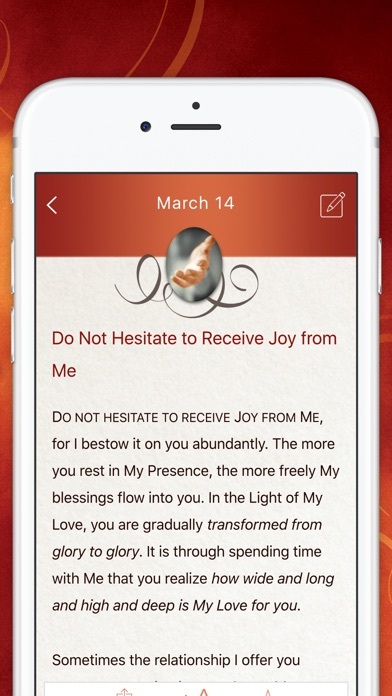 Some of the new features are great such as opening to today's devotion. Retaining notes is more efficient. However, I have not been able to synchronize with the cloud and I always have a network connection. Thanks. Latest update seems to have improved the scrolling sensitivity, thank you! Some of the new features are nice. Please bring back the screen responsiveness for iPad, though. While the app used to respond to the way your device was standing (whether portrait or landscape), it no longer does. Would love to have that back as it was easier to read in landscape mode. Thanks! Updated: Nov 21, 2017 - Love the content. Still worth buying, but buggy. Jumps to previous day. Can only view in portrait mode. Unable to view in landscape. Please fix. Previous Review: Like many, I have used this app for a long time and have enjoyed it so much I have gifted it to others. However, this latest update is a huge fail and takes away from the great content of the book. I am hopeful the developers of the app will quickly fix these issues. Is there a way uninstall the update? This is such a great app. I enjoy reading each message daily. It’s a positive and encouraging way to start the day. I highly recommend getting this app, however the scrolling sensitivity is way too high and it switches days just by scrolling when reading. I this issue was fixed I would give the app 5 stars. APP RENDERED USELESS BY UPDATE. App creator just informed me that this new update keeps it stuck in "portrait" mode. They went on to say some users have suggested it be fixed, so it might be in "a future update". I love the daily messages and the reminders of Christ in and around us at all times. I look forward to reading them everyday to help guide me through life with Jesus by my side. The content is awesome. The user experience: frustrating to say the least. Poor workflow and buggy to boot. Don't bother. I use this almost every day and pleased to have it. I like to copy a portion that means something special to me that day and paste it in notes. Then I like zoo go back and copy the. Erase that backs it up and paste T underneath. However, often the first item copied has disappeared. .?? What’s the point of copying and pasting if it won’t save permanently?? Audio not downloading after payment. Wheres the audiobook? It stays on 0% trying to download. Ill be taking my money back. I love the readings everyday, but this app is not working correctly. EVERYTIME I open it, it opens to small print, it opens to the menu for the year??? Then it brings up your list of notes about how it works!! Then have to move it to today’s readings.... Been waiting for it to be corrected! Once again, the journaling disappears. So disappointed since i cannot write in my paper copy, as i am recovering from a stroke. PLEASE fix that. I use JESUS CALLING everyday. GOD always has a message there for me. 1/16/18 The ability to highlight text is needed. That’s what people do on paper and in other apps with material for spiritual growth and reflection. Also graphic design wise, the photo backgrounds selection to paste text over are not reader friendly. The variety and contrast of colors means no text color can be consistently visible over the background. This is God’s word and I’d like to be able to savor it with these simple fixes. Thank you.